December is a month for frolicking and festivities, so you know we had to celebrate the season with our own little virtual happy hour. After all, the next best thing to reveling in the season’s merriment is talking about all our Christmassy faves! 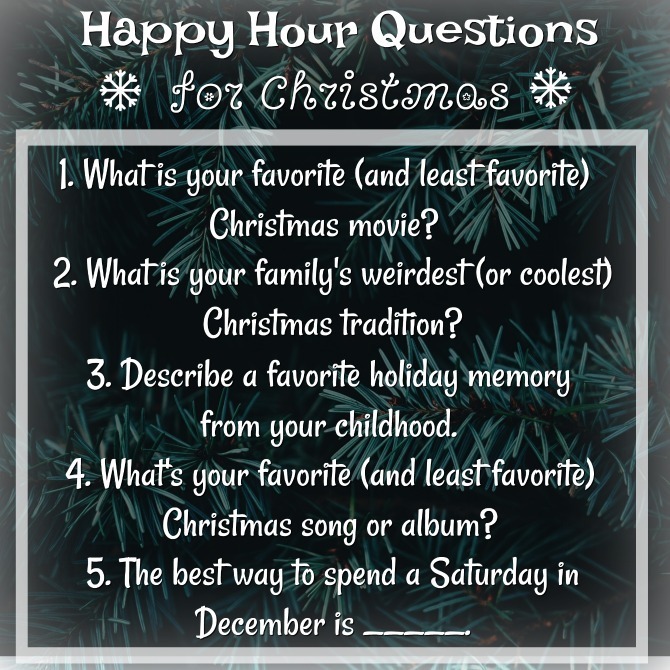 So make yourself cozy, settle in with a seasonal beverage of your choice (I’ll be sipping this), and let’s get this party started with some holiday-themed questions! 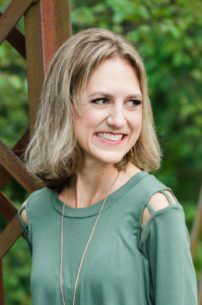 You know the drill: I ask the questions and answer them myself, and you leave a comment (or shoot me an email) with your responses! 1. 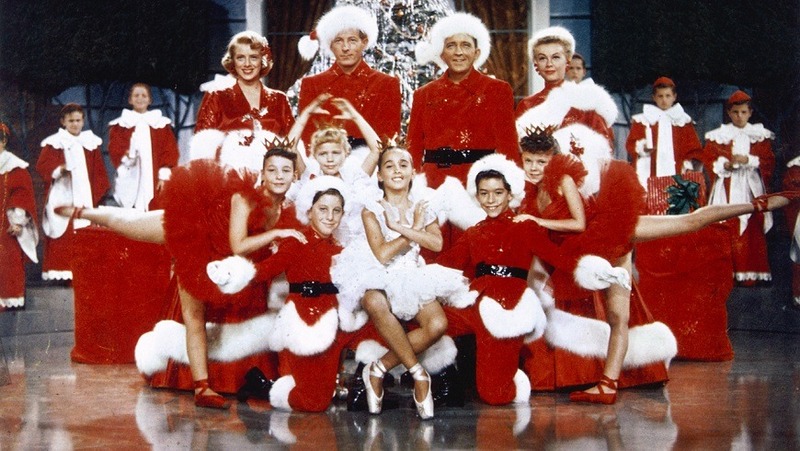 What is your favorite (and least favorite) Christmas movie? White Christmas and It’s a Wonderful Life are tied for my favorites. Runners-up include The Family Man, The Santa Clause, and Miracle on 34th Street (the original). Least favorite is A Christmas Story. 2. What is your family’s weirdest (or coolest) Christmas tradition? I’m not sure if it’s weird or cool. . . Luke and I (and now Charleston) set up a camera focused on our Christmas tree (always REAL) when we bring it into our house; then we take step-by-step photos of the decoration process. We’re sure to capture a shot of us putting up each of our annual ornaments, as well as a family picture in front of the tree at the very end. Growing up, our quirkiest family tradition was eating cold cuts for dinner before opening gifts with my grandparents on Christmas Eve. Another fun one was decorating our stair banister with Christmas cards we received. After Christmas, we’d take down one card each day to read at the dinner table. Some years it was Valentine’s Day before we were through all the cards! 3. Describe a favorite holiday memory from your childhood. Every year on Black Friday, our family would skip the mall and head to Knott’s Merry Farm, a seasonal craft fair located in Knott’s Berry Farm’s Ghost Town. (These days you have to pay full park admission for access to the fair, but back then you could get in for a fraction of the park price.) We would look at the crafts—which changed little from year to year but were still fun to see; have our picture taken with Santa; see the Snoopy Ice Show and a live performance of A Christmas Carol at the old-timey theater; listen to carolers perform in the Calico Saloon; and have a meal at Mrs. Knott’s Chicken Dinner Restaurant, all while wearing our favorite Christmas sweaters and Santa hats. Another treasured memory was participating in the annual Gingerbread House Making block party/decorating competition, hosted by our neighbors. Our Gingerbread Nativity Scene from the year I was 10 was a real showstopper! 4. What’s your favorite (and least favorite) Christmas song or album? “O Holy Night.” And “Carol of the Bells.” And “O Come O Come Emmanuel” … and “What Child Is This?” … and “Have Yourself a Merry Little Christmas.” But mostly “O Holy Night.” (Can you tell I have a hard time picking favorites?) Least favorite is easier: “Last Christmas.” Why is that song so popular?! As for favorite album? SO many, but Barlow Girl’s Home for Christmas, Josh Groban’s Noël, and all of Celtic Woman’s Christmas albums are hard to beat. 5. The best way to spend a Saturday in December is ___________. I can’t wait to hear your responses! And feel free to steal these questions to help break the ice at your next holiday gathering!